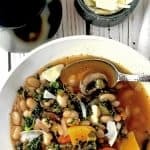 Winter Vegetable Soup features the goodness of cherry tomatoes, healthy kale, great northern beans and so much more all making for a warm and comforting bowl of winter vegetable soup. 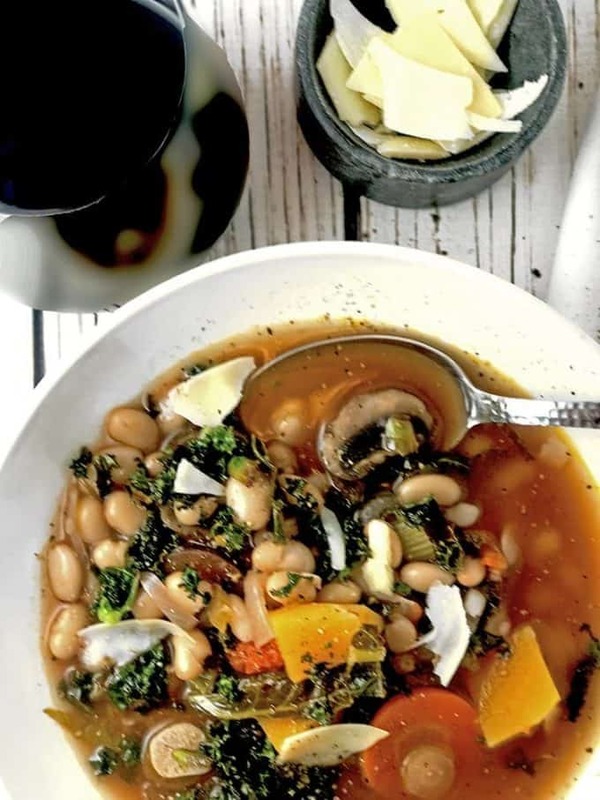 This winter vegetable soup recipe is perfect for the cold days of January and beyond. I’m not that good at remembering names, and on more than one occasion I have embarrassed myself dearly by not recognizing a face that in reality should have been one that is familiar to me. Call it a blessing or somewhat of a curse, when it comes to food I never forget a flavor. Fresh cherry tomatoes add a touch of summer to this comforting winter soup recipe. It was almost two years ago that I first tasted this Winter Vegetable Soup. It is full of comforting warmth, great health and for me, memories of a delicious dinner replete with good wine and even better people. 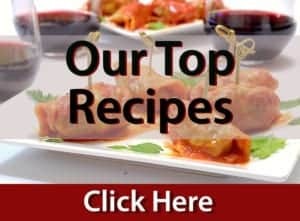 When I asked for the recipe, my friend who made this was kind enough to get it to me the following day. Though it’s been nearly two years since that winter’s March dinner, the lingering memory of fun people and great food has never left me. 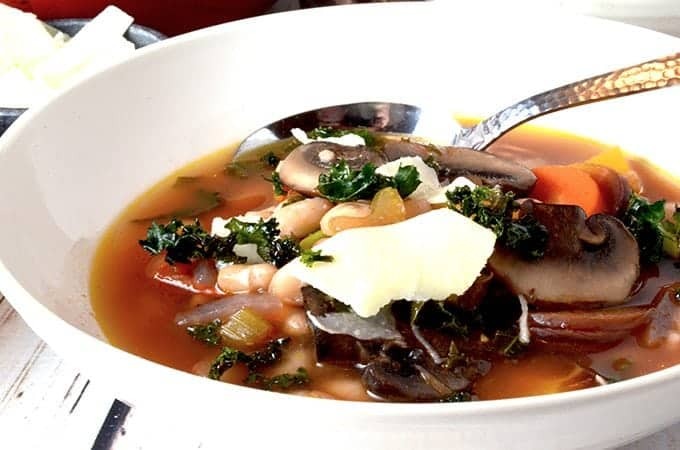 Some fresh herbs and some shaved Parmesan cheese make for the perfect garnishes in this winter soup recipe. 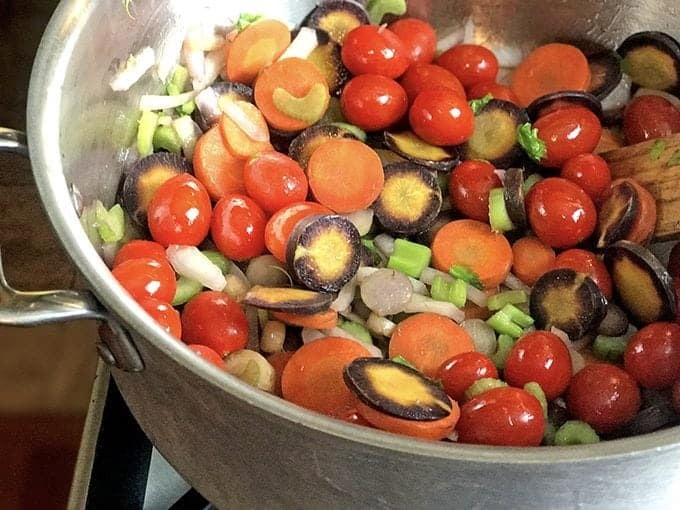 I was lucky enough to come across some rainbow carrots to use in this soup. Ever since I discovered them a couple of years ago and made Cayenne Seared Pork Chops with Orange-Glazed Carrots with them, they have become one of my favorite veggies. As I’ve been known to do a time or two, I veered slightly off the beaten path for this recipe of Winter Vegetable Soup and made it my own. Instead of using canned diced tomatoes, we used some fresh cherry ones. Although you can easily make this vegetarian and use water as the liquid base, I wanted to notch it up just a bit and opted for low-sodium chicken broth. Finally, in the end, I had some leftover kale, and so I decided to roast it and use the roasted kale as a garnish for this soup, and it is some of the best kale that I have ever tasted. 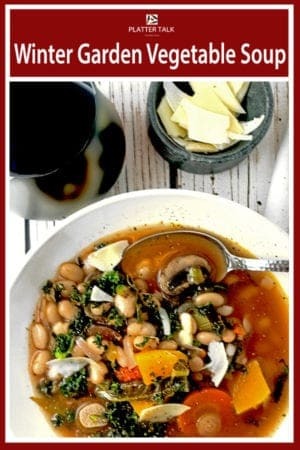 I suggest making this Winter Vegetable Soup soon and invite a friend or two over. Ask them to bring a friend as well, and you’ll be amazed at the people you meet and the great memories that will be made. A warm bowl of winter soup is a great way to deal with cold weather! Place 2 tablespoons olive oil into stockpot over high heat until the oil shimmers. Add the mushrooms and sauté until browned, about 5 minutes. Remove the mushrooms and set aside. 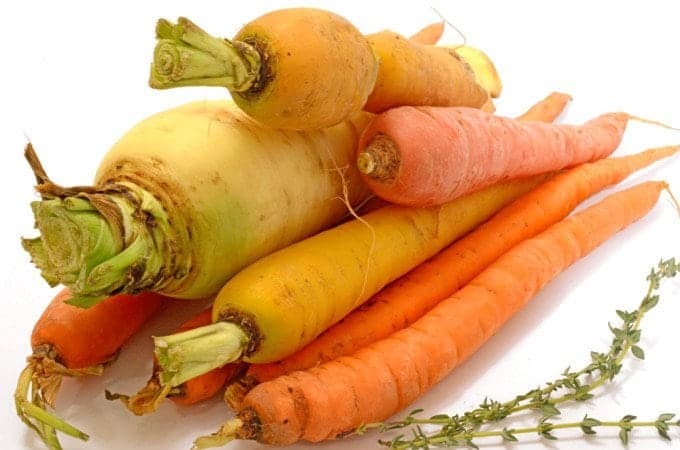 Decrease the heat to low, add the remaining 2 T olive oil and the carrots, celery, onions, and salt. Cook, stirring occasionally, until softened. Add the tomatoes, sage, rosemary, and garlic, and cook 5 minutes. Add the broth, soy sauce and Parmesan rind; bring to a boil, about 15 minutes. Decrease the heat to low, add the squash and kale, cover and cook until tender, 30 to 35 minutes. Add the beans, mushrooms and red wine vinegar and cook until heated through, about 15 minutes. Serve with Parmesan cheese. In lieu of cherry tomatoes, you can substitute a can of diced tomatoes. To make this vegetarian, use water or vegetable broth instead of chicken broth. Share this soup with your neighbor and spend some time catching up. Updated from the original post of January 27, 2017. Pin this Winter Soup Recipe for Later. Thanks for the wonderful feedback, we’re happy you enjoyed this easy recipe. Such an amazing soup packed full of delicious veg. I’m sold! A good veggie stacked soup is hard to beat for lunchtime satisfaction. I love your version with the addition of kale. A good veggie stacked soup is hard to beat for lunchtime satisfaction. I love your version with the kale mixed in. Rainbow carrots are the best. I always find them at Trader Joe’s and love using them in all sorts of recipes. I need to make a soup like this every week and just keep it in the fridge for healthy eating lunches every day. Thanks for the inspiration! wow this is packed full of goodness, it sounds delicious! 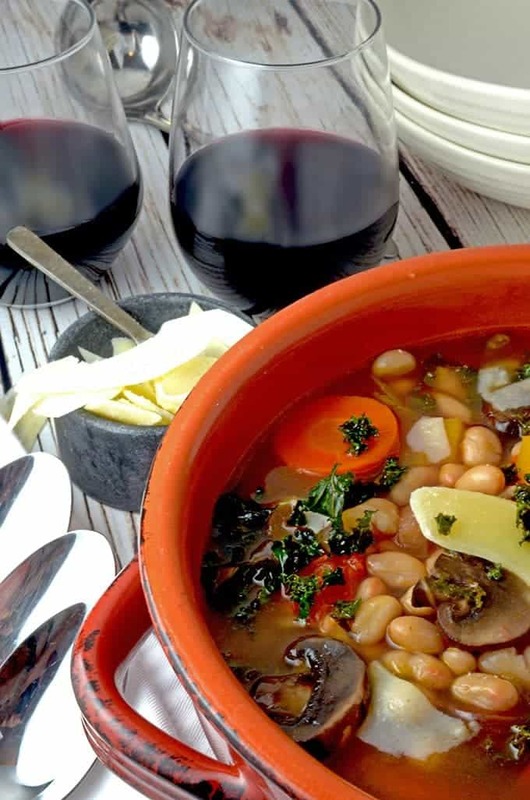 There’s nothing better than a glass of wine and a hearty soup to cure the dead-of-winter blues. I love your idea of using cherry tomatoes, since regular tomatoes I find at the grocery this time of year are mealy and gross, and I do get tired of tinned tomatoes. The roasted kale garnish is a stroke of genius. This gorgeous soup looks like a hug in a bowl! It’s still cold weather and I’d love a bowl of this to warm me up! Mmm this sounds good! What’s a great northern bean though, to us uk readers? This looks hearty and delicious and the perfect way to warm me to my core during this very cold winter we’re having! Looking forward to making this for the [email protected]! I love the addition of Parmesan rinds to the soup as it cooks: it’s one of my favorite tricks! This looks amazingly fresh and delicious. It is amazing how the memory of a good meal can stay with you – and how recreating the recipe can bring back all the lovely memories! This Winter Vegetable Soup looks like real comfort food, full of wholesome ingredients and lots of flavour. 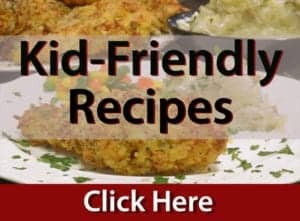 Definitely great food to make memories over! Mmm, this is the kind of soup that could just warm you through and through! I love the roasted kale as a garnish, too. I’ll have to give this a try! Oh Yes, this is what I need right now for the cold weather 🙂 Looks so warm, hearty and comforting. This is a gorgeous soup! There is nothing better than coming home to a delicious soup like this winter vegetable soup. Love the added butternut squash- yum! I could have soup all year round. I love the flexibility of being able to use whatever veggies are on hand. I bet this really hits the spot! It hit the spot, very nicely Andrea. As a bonus, it makes for a great leftover! I love soups like this. So full of flavor and has all of my favorites. Perfect for a comforting one bowl dinner! I’ve made a similar soup and love all the hearty, healthy flavors. Great way to use kale too! Wow, this soup is literally packed with veggies! Love it!